Luxury brand Brikk brings you the most desirable finishing technique on the market — 24k Gold intended for wealthy gaming enthusiasts. Using this finish they created a a special PlayStation 4 DualShock 4 controller, designed for the gamer with impeccable taste. 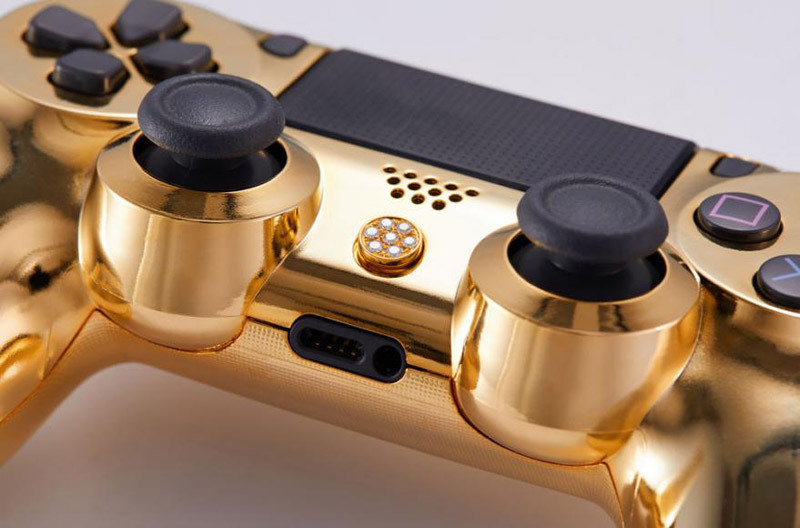 Coated in 24K yellow gold and safeguarded by a triple layer of DLC protective clear veneer, the customized controller, called the Lux DualShock 4, is available in two versions, Classic and Deluxe that are priced at $8,495 to $13,995, respectively. 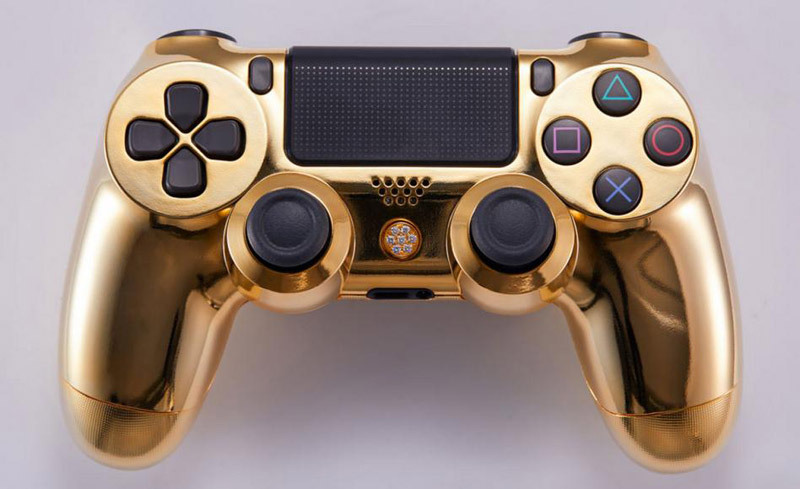 Classic version includes a playstation button made from solid 18K gold and features seven perfect diamonds of F/G Claity, totaling 0.25 carats. All other buttons are from the original SONY JDM-055 model controller. Deluxe version features nine solid 18K gold buttons: the “Playstation” button, the four directional buttons and the triangel, circle, X, and square buttons. These buttons are studded with geniuine conflict free diamonds of F/G Color and Clarity totaling 2.20 carats, making any controller resplendent. And, that’s not all, there’s also a more expensive option available where you can add even more diamonds into the mix. Those customization options include controller wrapped in platinum, rose gold, black rhodium or rainbow titanium, and the buttons can be made out of titanium, carbon, zinc or magnesium. Embellishment options include higher grade diamonds or alternative gems including rubies, sapphires, emeralds, and many other precious stones. For the perspicacious individual, dome shaped thumbsticks including custom stick heights and trigger stops can also be added, with board mods like disabling vibration, faster rapid fire, and multiple custom game specific configurations. Uniquely crafted to exacting specifications, this is the ultimate companion for all discerning gamers. Lux DualShock 4 controller by Brikk is delivered in an exclusive aluminum case with a custom carbon fiber and foam insert. 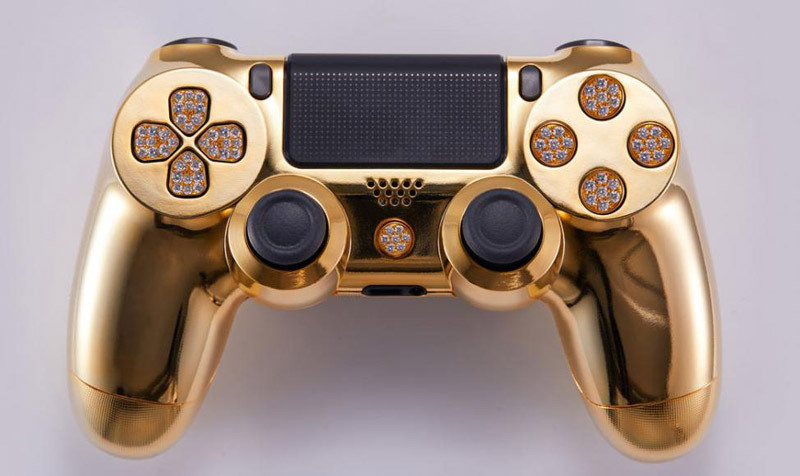 The gold and diamond encrusted controllers are available for order now, with deliveries in 2-3 weeks worldwide.